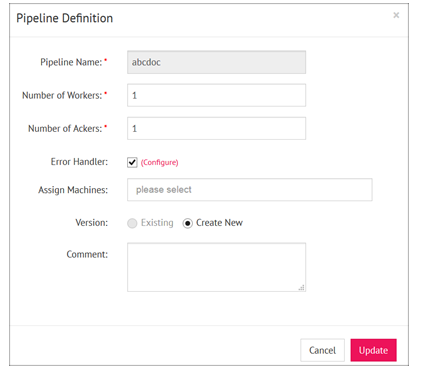 Versioning of Pipelines enables you to create different versions of the same pipeline and rollback to a previous version for testing purpose. When you create a new pipeline, initial version is 1 by default. Once you update the pipeline, you can either create a new version or overwrite changes in the exiting version. Note: If you create a new version of the pipeline, update the comment (not mandatory but required to keep track of the changes). This brings the window shown below, where you can choose the versions.